Time and space are those two things that have always managed to stump the world’s greatest thinkers, leaving us to the stark realization that we are but visitors on this rock, hurling through time and space at 66,000 miles an hour, tethered to a burning sphere by an invisible force in an unfathomable universe. This most of us take for granted, while refusing to believe these forces have any more effect on us than a butterfly beating its wings halfway around the world. Yeah, I stole that quote from the X-Files and my mention of time and space here is under a different context, a more literal one; most of us need more free time and a larger space to work in! I am constantly trying to find more room for my junk (priceless parts collection) and at the same time store my creations, but there is never enough room, so often bikes are recycled for parts after a year or two. This constant shuffling of stuff then leads to my ever present lack of time, and often I just let things pile up and work around the mess since a full cleaning would take most of the day away. 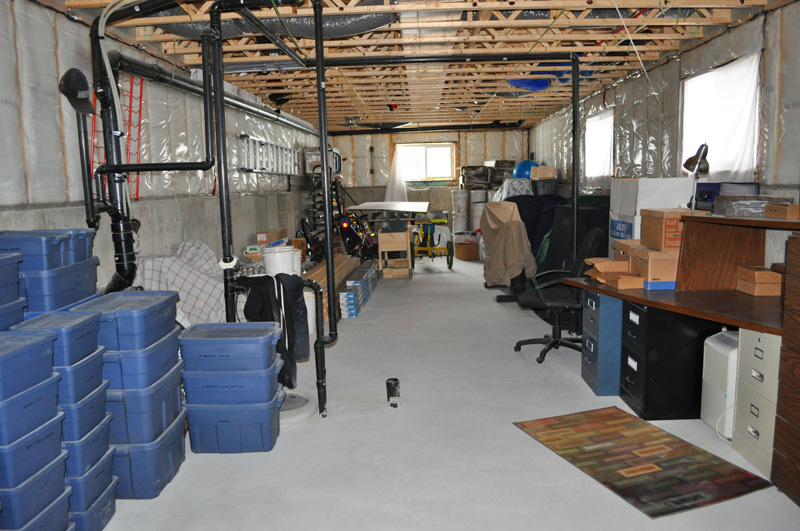 After we moved into a single wide modular home, I knew that my indoor workspace would need more a lot more room; it was time for some basement renos. I have a fair collection of electronic bits for my work, so storage space and workbench room are very important. I decided to turn one end of the basement into a lab. 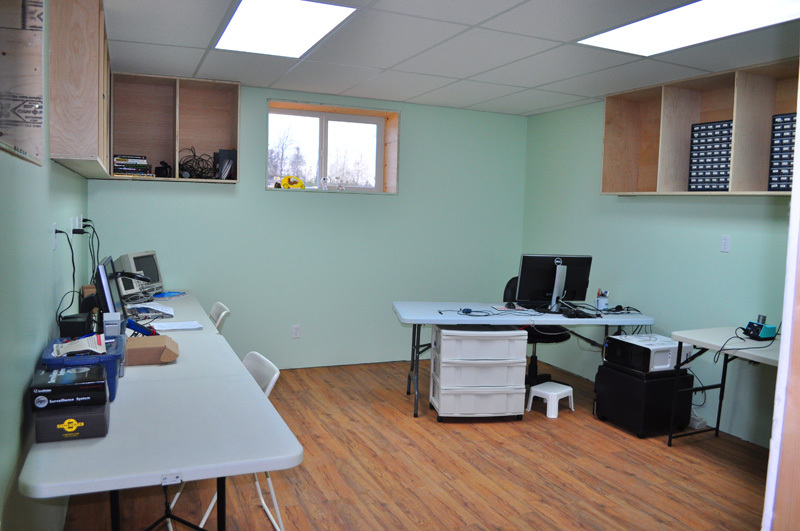 It’s always fun to share photos of our workspaces, and since I have blogged about my old bike building shack down at the bottom of the hill, I thought it would be fun to show the space I am occupying as I write this now. The lab! Anyone who has been in a modular home knows that they are 16 feet wide and long, really long! We decided to custom design the modular to sit on a full 9 foot basement so that we would double our space and end up with huge windows, making it seem less like a basement and more like a split level. The engineered trusses are great because all of the ductwork is out of the way, 9 feet about the floor level. All of my electronics parts, robot bits, and good bike parts ended up in the basement, since we have very little outdoor storage space. The AZ parts orders are also packed down here on the brown table. There is a decent amount of space here, but I have not had much time to organize it or do any work. I did however, get to complete my new lab recently and am typing out at you from it right now. When you are a DIY type, it doesn’t matter what materials or tools you are using – you just measure three times, cut once and adapt along the way. Working with wood is certainly easier than steel, but doing a proper renovation does take a lot of research into code. 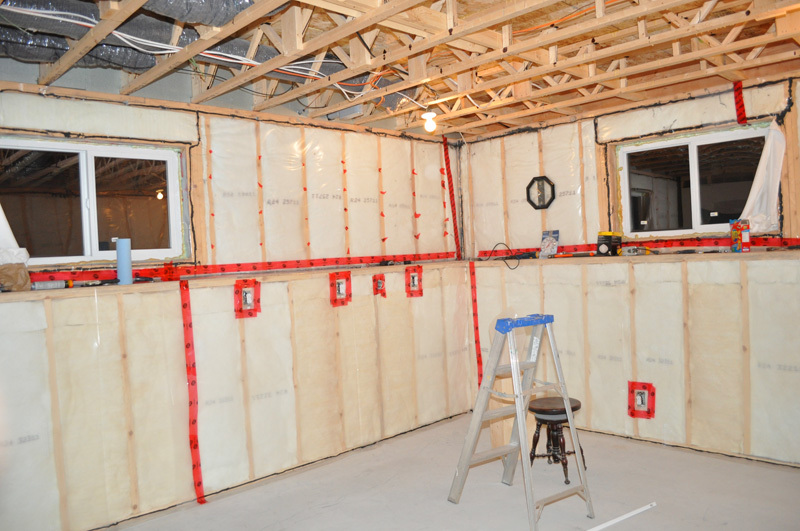 Living in a Northern climate and having a 5 foot concrete wall with a 4 foot stud wall on top took some amount of planning in order to get the insulation done correctly. I had to build another 2×6 wall an inch ahead of the concrete wall and create an air barrier on the cold side then a vapor barrier on the warm side, keeping to an R24 insulation value. Sure, I know what I am talking about now, but when I started, I didn’t know the deference between an air barrier and a moisture barrier. A moldy basement was not something I wanted, so I did my research. The secondary wall took out about a foot from the width of the room, but it still ended up being 14×16, and that was certainly enough room for me to work on my technical projects and plan writing. I continued the secondary wall up to the top, added a suspension ceiling, lights, lots of electrical and then put down a waterproof composite floor that looked like hardwood. I was quite happy with the final results, considering much of the things I did were new to me. I still need to finish building the cupboards and workbenches, but I am quite comfortable on the temporary tables and have plenty of room to store my stuff. So, if time permits, I will once again expand my space, enjoying the rewards of DIY and learning new skills as I move along. No doubt, if you are the type of person who would build a bike, you probably enjoy other DIY projects as well around the house and yard. DIY is a way of life! I know, it’s a bizarre name for a blog title, but when I started doing these morning musings, I decided to just write about the day before and try to keep it fun! As I had mentioned previously, this place has been like a rain forest lately, with rain almost every day for weeks on end. This onslaught of cloud juice has made bike building a real chore since I work outdoors mainly and have a completed bike that I need to take final photos and videos. Yesterday, the rain turned into more of a drizzle so I took this rare opportunity to get the mower out and get some of the yard cut. 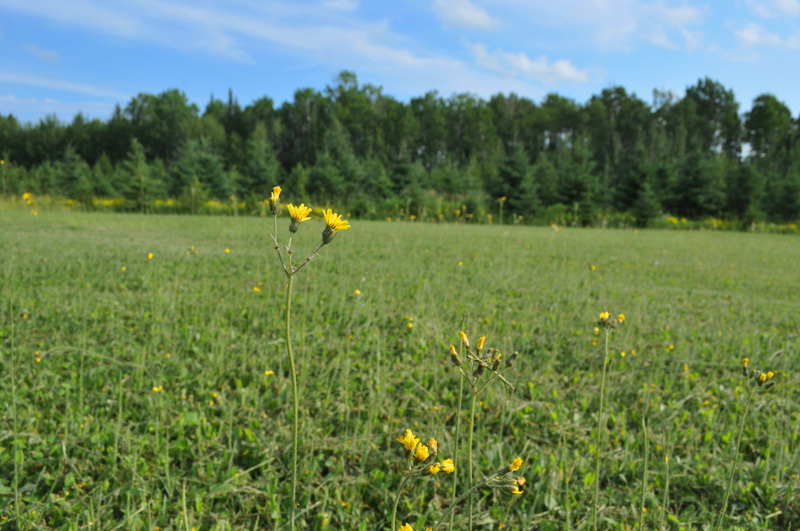 Now, this may not seem like much of a big deal, but we have to mow a three acre section of the yard. 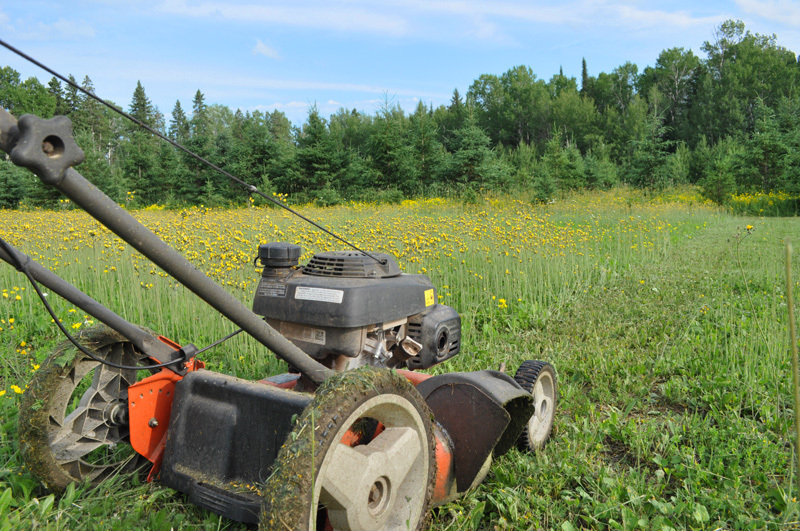 OK, that may also seem like no big deal but get this…I hand mow the thing! No doubt you think I am insane for mowing three acres with a hand mower, but we have no place to store a ride mower, and this twice monthly mowing sure keeps my legs in good shape. Of course, a true garage hacker would NEVER EVER use an unmodified appliance, so of course I turned this otherwise tame mower into a beast of fury by modding the deck. As you can see, the safety guard thingy that once held the bag has been replaced by a steel horn like thing that looks more like a snow thrower output horn. This little mower can now shred 3 foot grass, leaves, even small trees into mulch, tossing the shavings in the air a good 10 feet. Before I made this scary mod, the mower could barely cope with knee high grass and would jam up once every half hour. When I mow this yard, it takes me seven to eight hours if I walk non-stop, only stopping to refill the tank. Since we have been having rain forest like rain lately, I have not been able to mow for more than two weeks, and these tall yellow glowers have taken up most of the yard. I don’t know what these things are, but I don’t think they are from this planet, and probably came here on an asteroid or some alien probe. In two weeks, these things grew over 2 feet tall and they can actually survive being run over by the mower. Yeah, no kidding, I mow them over two or three times and they just pop back up! I pulled one out by hand for inspection and they seem to have a stem made of green carbon fibre. 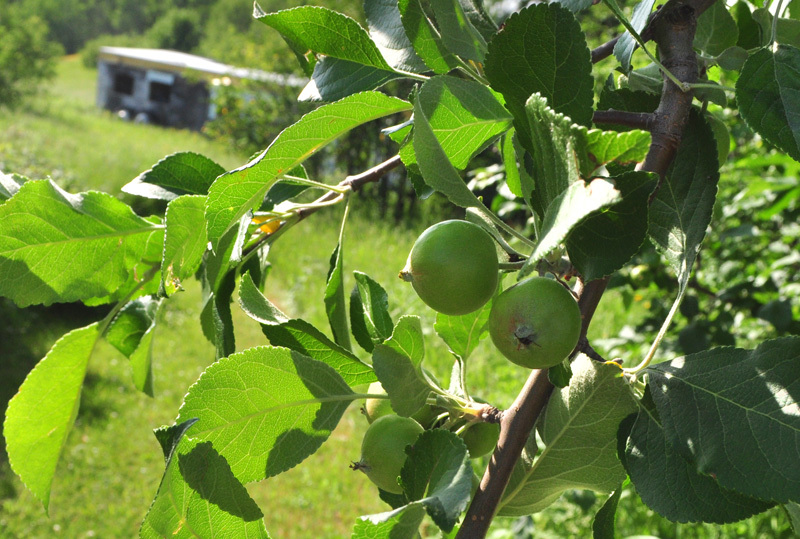 At less than a quarter inch thick, the stem is so durable that it cannot be snapped by hand, and is as strong as wire. Anyone know what these things are? I wonder if dynamite will get rid of them? 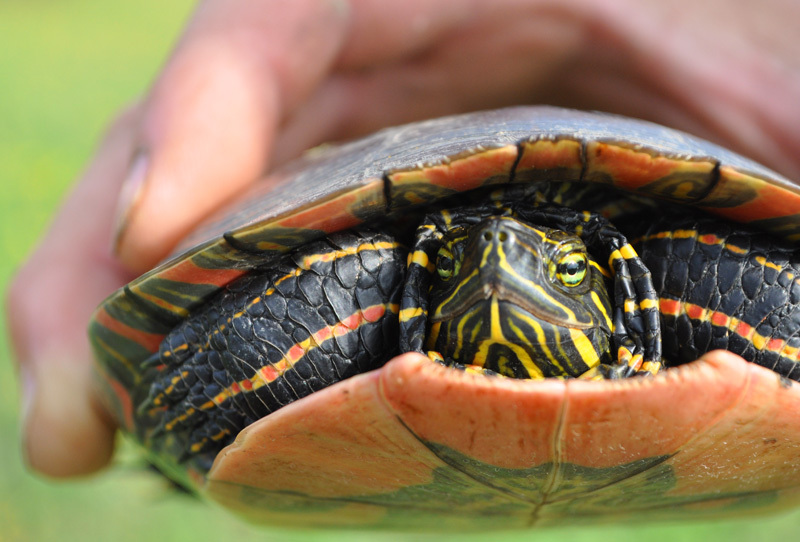 Half-way through my mowing, a turtle decided to crawl up the hill through the tall grass for a visit. This little guy/gal was a bit annoyed by being picked up at first, but then relaxed and seemed to enjoy the free ride to the other side of the yard, away from the Yard Muncher. There are several creeks and ponds way back in the yard, but these are almost a mile away, so it must have really wanted to explore to make that kind of journey. With the way the weather is changing around here, I wouldn’t doubt that the next thing that comes wandering our of the pond will be a big ol’ gator. It’s official; we now live in the rain forest! And, when it’s not raining, the humidity hovers between 70 and 80 percent, so it might as well be. Oh well, here I am complaining about the rain when three months ago I was up to my waistline in snow. 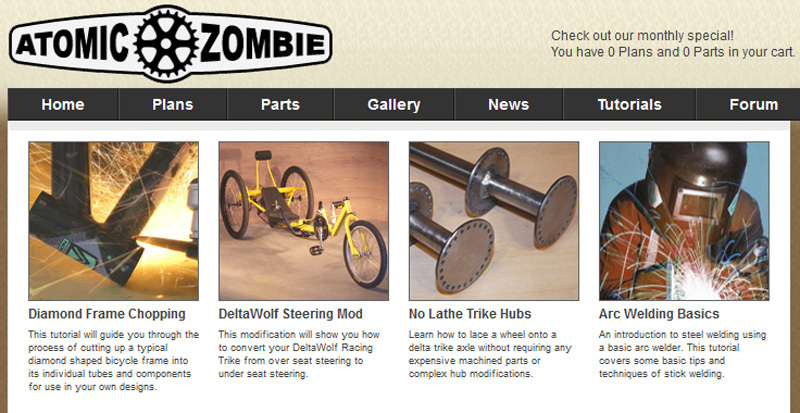 I guess that spring and fall really are the only good seasons for an outdoor bike hacker like me. This week’s forecast is pretty much the same as the last two months with 40 to 60 percent chance of showers, which really means spitting rain every hour followed by intense rain for a few minutes and then 70 percent humidity until the next wave of rain. I don’t ever remember this much rain, and I am seeing plant life that looks like it belongs in the Amazon jungle around here. But, the robot was fun to operate. I would sit indoors looking at a video link being transmitted from the head mounted camera and navigate (carefully) around the block, interacting with stunned bystanders using a text to speech processor that made the robot talk. I do miss building these things. Once I have an indoor workspace again, I have plans to build a 4×4 autonomous robot that will patrol our yard and keep that dumb bear off the property. I’ve always had a passion for radical bike designs. Well, within months I started connecting with some amazing people and realized I wasn’t the only one who enjoyed making art from metal, sometimes for fun, sometimes to be practical. It didn’t take long before the word spread locally, and we were dragging my creations to all kinds of events. The large video guided robots were always popular. I enjoyed inspiring young hackers to consider this great hobby. The robots were a natural crowd magnet since I controlled them from miles away via video link and could communicate to people by typing words into a speech synthesis station at the base, making the robot seem intelligent. 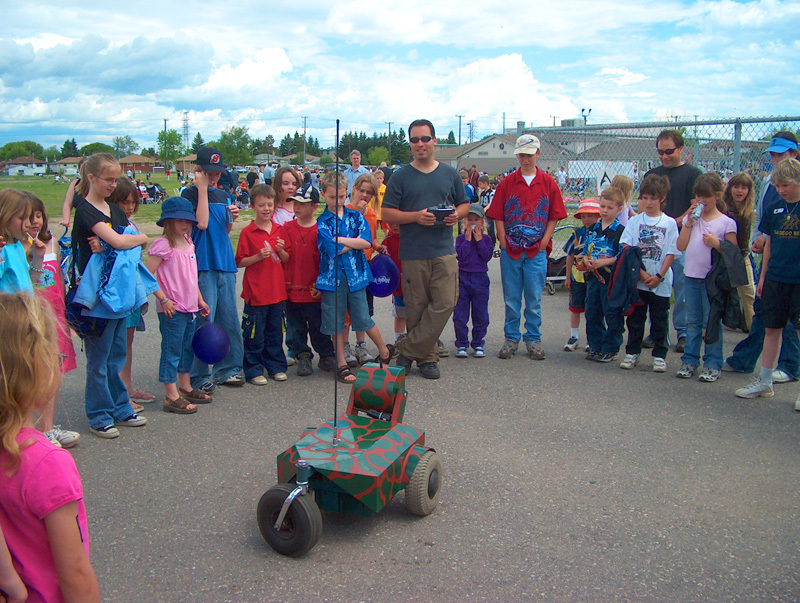 Soon my remote robots’ main purpose was to draw in a crowd and baffle them with technology. When the tallbike called “SkyCycle” made it to a full color page in the Guinness Book (along with my mug), I was shocked. I knew these crazy contraptions could draw interest, but I had no idea how far it could go. Even a simple recumbent bike like the Marauder would spend half the time parked as I explained the bike to interested people along a ride. No doubt, all you DIY enthusiast out there know what I am talking about. When I think back to me pre-DIY days, I guess my inspiration did come from seeing others’ creations, although it was mostly in the form of photos from old Popular Mechanics books or the odd newspaper article. Now, with the internet jacked into our heads like The Matrix, it’s so easy to connect with other DIY folks and share advice, so the community is stronger than it’s even been. Back in the early 1980s I would have never thought that one day I would be saying, “Hey!” to a cargo bike builder in Africa and then a trike builder in Australia within a 15 minute span. So, if you are a new builder just getting ready to roll open that garage door and head out on your new DIY creation, get prepared for the attention your work will draw. 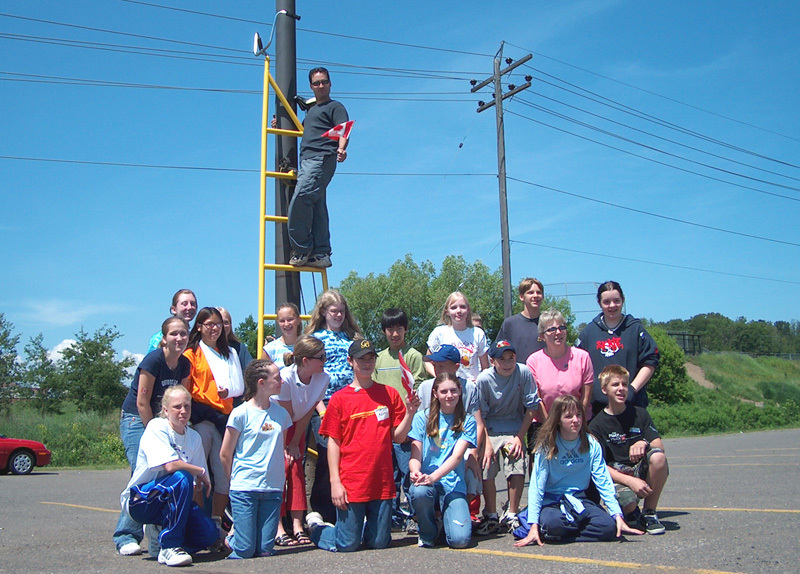 You will now become the source of inspiration for a young generation of future DIYers, so make sure you pass along that attitude that drives us all, “Yeah, you can do this, too”! 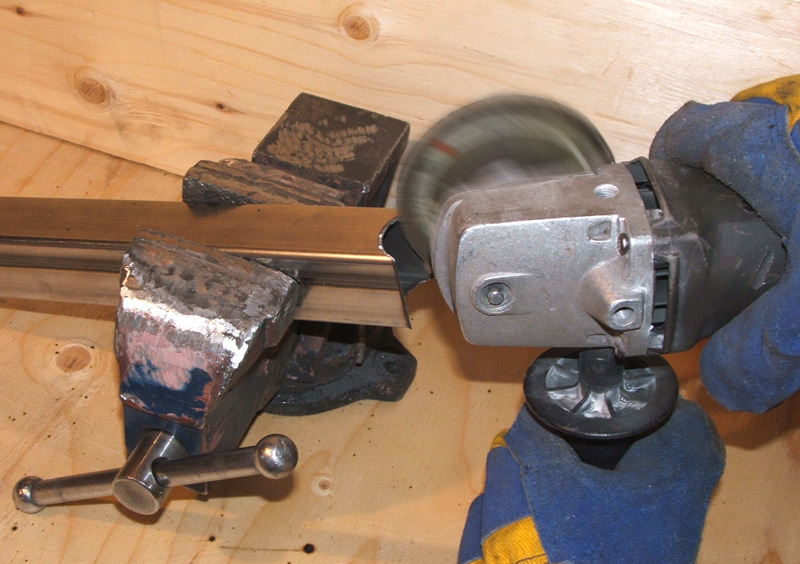 In 2001, I decided to tinker in the garage with my angle grinder. Once in awhile, I like to dig through my photo archive labeled “the Graveyard” where I keep photos of unfinished or failed bike and trike concepts made over the years. Sometimes these ideas just fail completely, or they become too complex to make into plans since I try to ensure that anyone with nothing more than a basic welder and a grinder can do the same work I do. 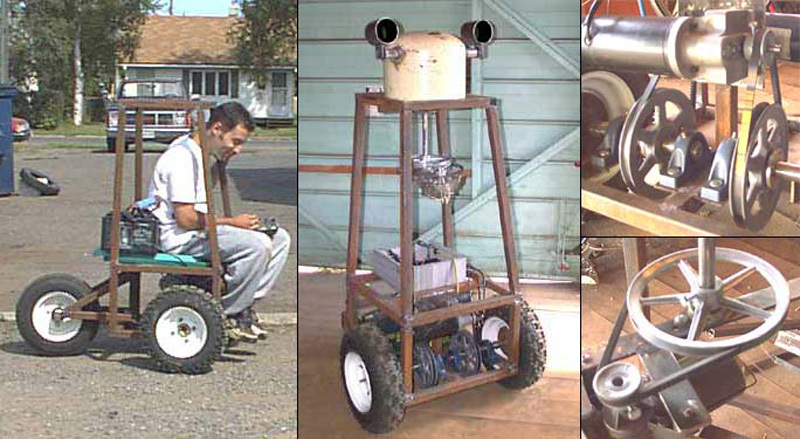 So, I was waiting for some microcontroller code to compile the other day and I want for a photo trip down memory lane and found an old project called “the Sociable Tadpole Trike” and it sparked some new ideas. I remember building this thing sometime around 2001 or so. 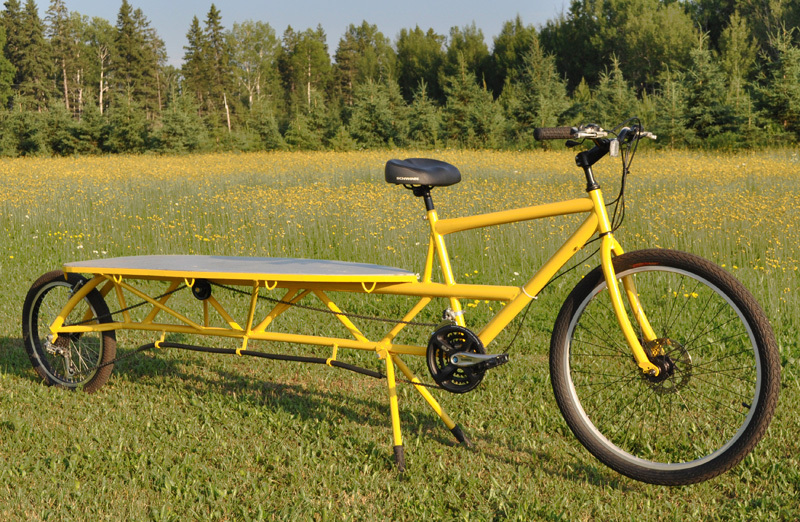 I scoured the ‘Net for any examples of a side-by-side (sociable) tadpole trike (two wheels up front) and there was nothing out there at all, so I thought it would be cool to make the first one. Without any forethought, I spent a free Saturday cutting up tubing to make the trike. I don’t think I even measure a single tube, but sometimes that’s how it goes when you are driven by an idea – cut first, measure things later! I had some leftover machined 20mm tubes that were part of another project and they fit nicely into a 20mm hollow axle hub wheel set that I built the year before (these were eventually used on the Warrior and Viking Trikes). To make the front steering, fashioned a bracket from two pieces of angle iron and then welded the 20mm tubes to another tube that held some brass bushings. A bolt acted as the kingpin. 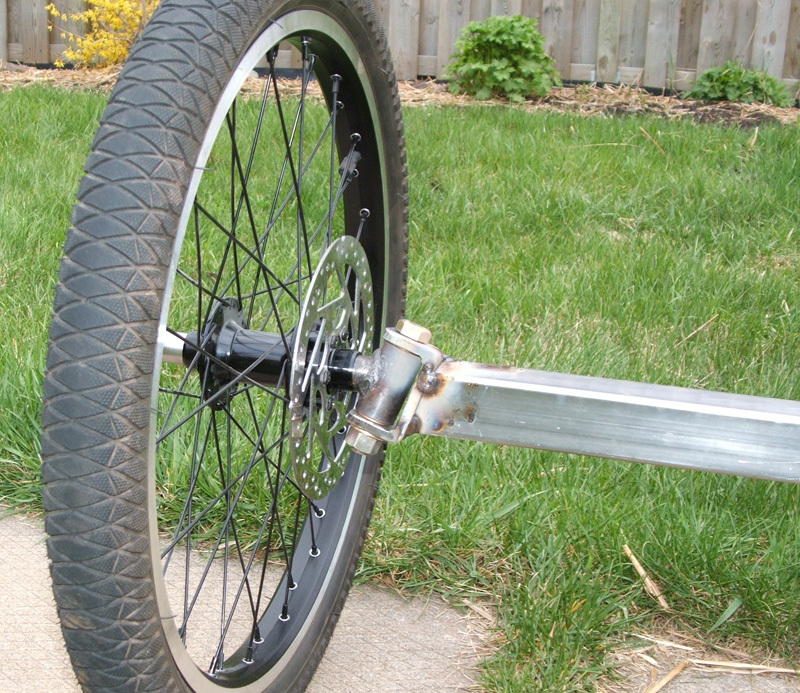 The odd angles shown between the kingpin and axle tube are there to allow for center point steering (this makes the wheels pivot in their center on the road). My first attempt at center point steering. This steering system worked out quit well, but I never used it on any of our plans because it requires four machined tubes to be made and unless you have your own lathe, these small jobs cost a lot to get done at a machine shop. But, for this prototype I decided to just use whatever bits I had on hand in order to make the trike functional in the one free day I had to work in the garage. Yeah, back in 2001 I had a garage to work in, so I didn’t have to dodge the weather all of the time! 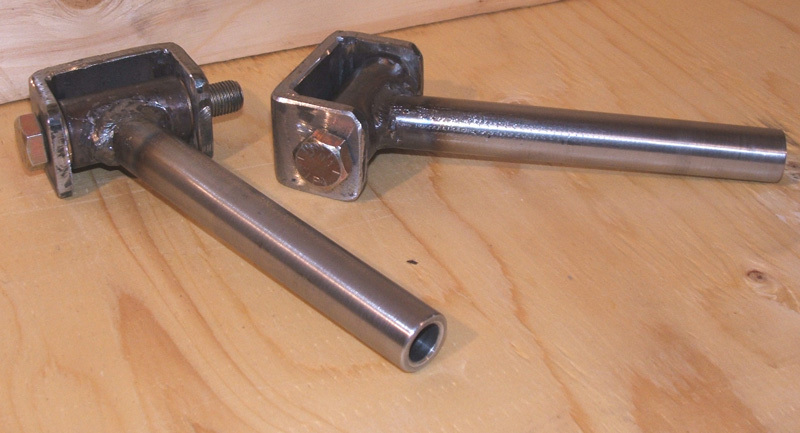 The prototype trike required machined tubes for the steering system. The Sociable Tadpole Trike went together in a hurry and actually looked pretty good when it was done. The steering was almost perfect and the frame seemed stable and strong. I even had an independent transmission system rigged up that ran the two cranks to a transaxle that had independent derailleurs for each rider and a main drive system to the rear wheel, but sadly, I did not take any photos of this unit. I thought for sure that this trike would make it to the plans page, but after rigging up some temporary seats the next day, I found an unfixable flaw in this design – elbow room! It seems I misjudged how much room two people sitting side-by-side would need, especially with the captain having under seat steering, so the trike would need to be almost 5 feet wide in order to steer properly and not have the rides sitting shoulder to shoulder. 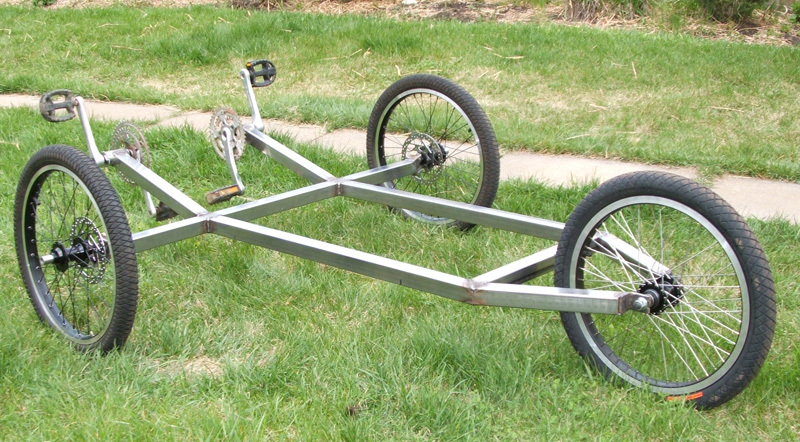 I made the trike exactly 4 feet wide, and decided that a 5 foot wide trike would be too wide for any practical use. Eventually, this design was flipped around and made into the Kyoto Cruise Sociable Delta Trike, which was no wider than 4 feet. But, the point of this musing is that I intend to revisit this concept once again, and have a wild and crazy idea on how to make the trike less than 4 feet wide, have an independent transmission, suspension, and need only simple components. Are you ready for this one? Front wheel drive and rear wheel steering! Yeah, that’s right! It will have fixed front wheels driven independently like on the Kyoto Cruiser and run a linkage to a rear steered wheel. 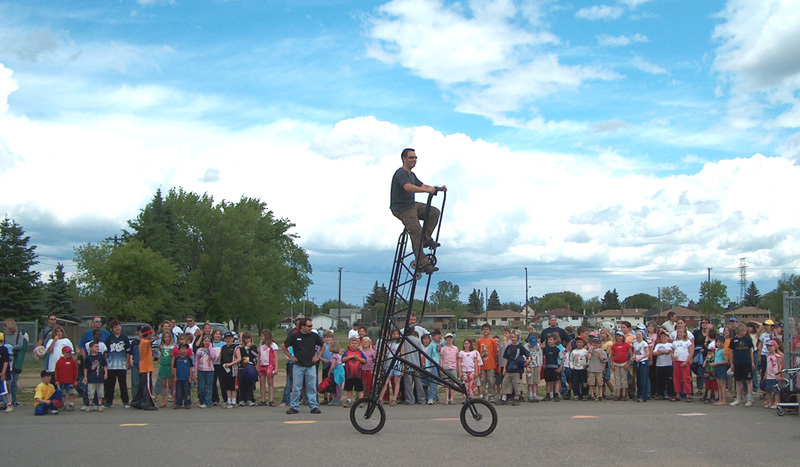 Now, normally I would recommend against a rear steered vehicle as they have quirks, but in this case, the width of the trike along with the riders being placed over the front axles would make the trike stable. 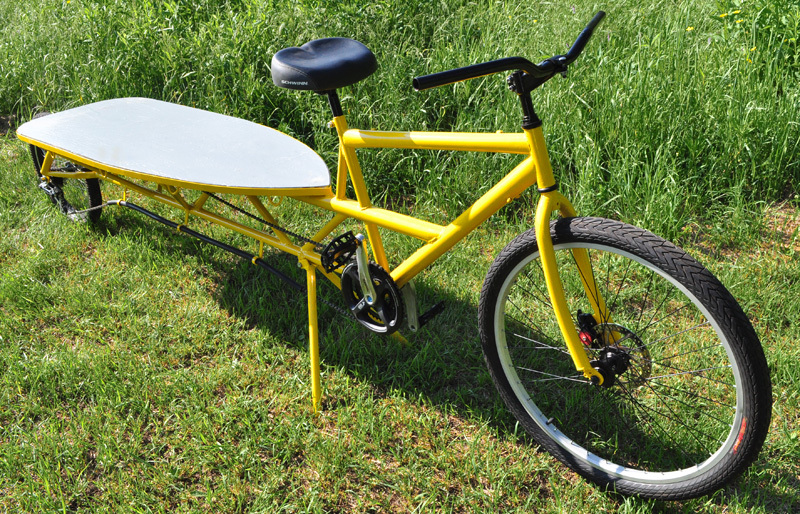 I wouldn’t use it as a racing trike, that’s for sure, but for a fun sociable trike, I think the rear steering would work just fine, and allow for a nice stable ride with a great turning circle. There was an interesting rear steered three wheel car called the Dymaxion invented in the 1930s by Richard Buckminster Fuller and it seemed to be quite maneuverable and stable from the text I was reading. The length and width of the trike seem to make the difference, which would make sense if you think about how a rear steered vehicle would handle. A short wheelbase rear steered trike would want to oscillate due to momentum of swinging the rear during a turn, which would then cause the pilot to counter steer and create a hard oscillation that could lead to a rollover. Add speed to this equation, and you have a ride that would not be easy to tame. Add a wide track and a longer wheelbase to the vehicle and it should steer more sensibly, allowing the vehicle to make nice tight turns and handle in a controllable manner. 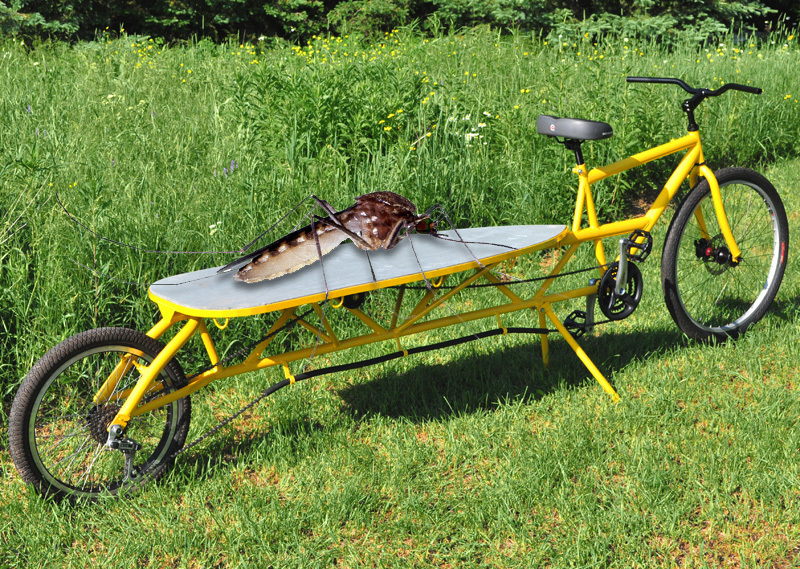 Now, this is just my “guess” on how the thing will actually work, but I have been thinking about making this my next trike project for 2013, since I really miss the aspect of cruising side by side. If this new FWD Sociable Tadpole Trike actually works, it may be the base for a full body, since it would be easy to make one due to the fixed front wheels and the teardrop aerodynamic shape. 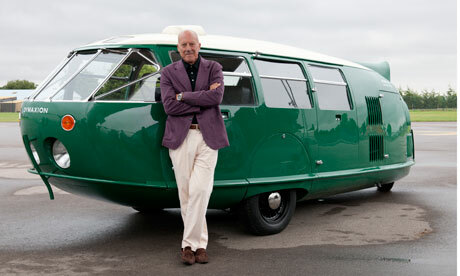 In fact, the body might look like a mini Dymaxion! Well, there you have it, a new idea is born and it will involve some things that have not yet been tried, so I am all charged about either making a new plan or adding to my folder called “the Bike Graveyard”.